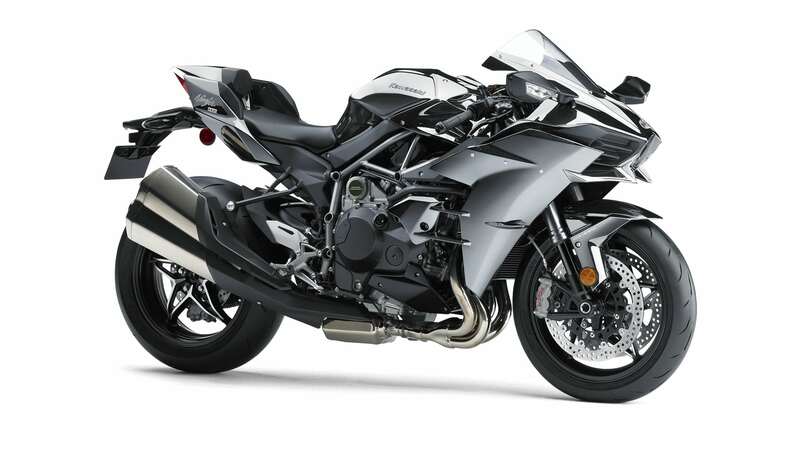 The 2016 Kawasaki Ninja H2 has an upgraded clutch, revised ECU settings and a new colour scheme. Kawasaki’s supercharged Ninja H2 has received a couple of updates for 2016 and is now available through selected dealers. The 2016 model has an upgraded clutch, revised ECU settings and a new colour scheme. When it was launched last year the Ninja H2 already had a slipper clutch to help prevent the rear wheel from locking up during aggressive downshifts. Kawasaki has now upgraded the clutch to what it calls an “assist and slipper clutch”. The clutch assembly is 1kg lighter and Kawasaki is claiming it requires 40% less effort to operate. The engine settings have been tweaked, in particular the rain mode which now gives a more natural power delivery. Kawasaki has added a CAN coupler that allows aftermarket data loggers to be used with the H2. The new colour scheme is called “Mirror Coated Spark Black”, and at first glance doesn’t appear all that different to last year’s model. The biggest distinguishing feature is that the frame is now grey rather than the green, and a closer look reveals a glitter effect in the paint. Kawasaki has also added $1,000 to the price, taking it to $34,000 plus on-road costs. Sales of the H2 have been steady but not spectacular, and the company revealed last year that both the standard model and the track specification H2R will remain in limited production for at least 2016. In Australia, the Ninja H2 is only available through H2 authorised dealers.